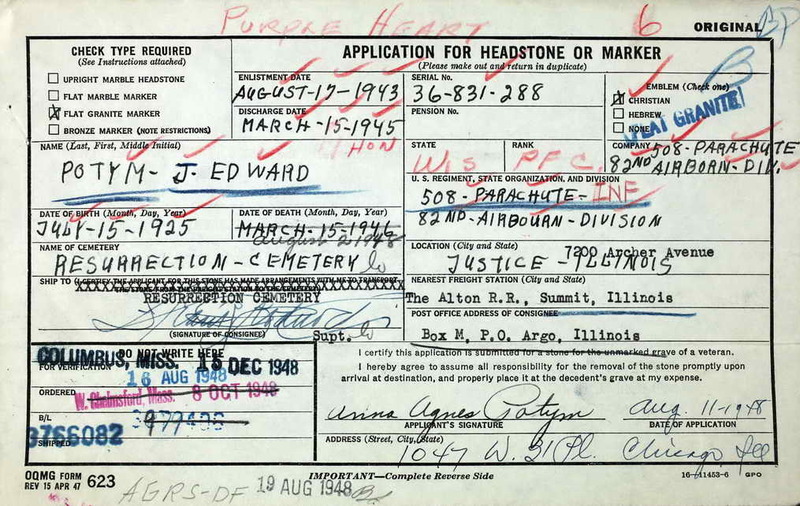 Application for grave marker for Edward J. (J. Edward?) Potym to be erected in the Resurrection Catholic Cemetery and Mausoleums, Justice (Cook county), Illinois. Note that the use of "J" is reversed from civil records, including his birth record in Cook county, IL. Edward enlisted in the Army on 17 August 1943 and was transferred from Hq 82nd Airborne to Hq 1st, 508 PIR on 23 July 1944. Already in combat, he was promoted to Private First Class on 12 January 1945. Less than three weeks later he was with a group of men in a 81mm Mortar squad. Sgts Bill Goudy and Glenn Somerville moved their squad leaders into a large stone barn to give instructions on their next task. An artillery shell came through the wall killing Pfc Steve Tetak. Bill had shrapnel wounds while Somerville lost his left arm, left eye and toes on his left foot. Pfc Potym, according to Goudy's report, "had a broken leg from stone falling on him." Pfc Potym's injury was more than a broken leg, however, as after he was evacuated to a field hospital the limb was amputated. Edward died in Fort Atkinson (Jefferson), WI on 2 August 1948 at the age of 23. The circumstances of his death are unknown.